The day we announce the Love Radius PhysioCarrier. 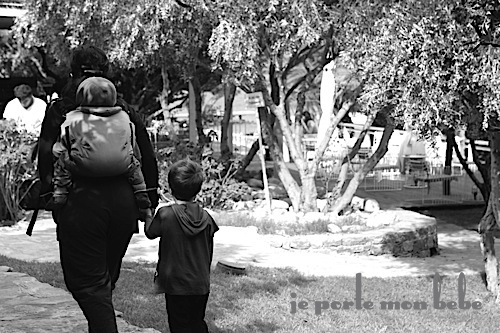 The PhysioCarrier is exactly what parents expect in 2015 from an upscale preformed baby carrier designed and manufactured by Love Radius: a baby carrier that is uncompromisingly modern and truly versatile. We are very proud this was made possible by a small independent French family business like Love Radius. The PhysioCarrier has all the Love Radius DNA: the pocket of the Original baby wrap, the leather (artificial) of the Little Wrap Without a Knot. But beyond esthetics, what you mainly rediscover is all the expertise of this baby carrying method that respects Baby’s sensory and neuromotor development. 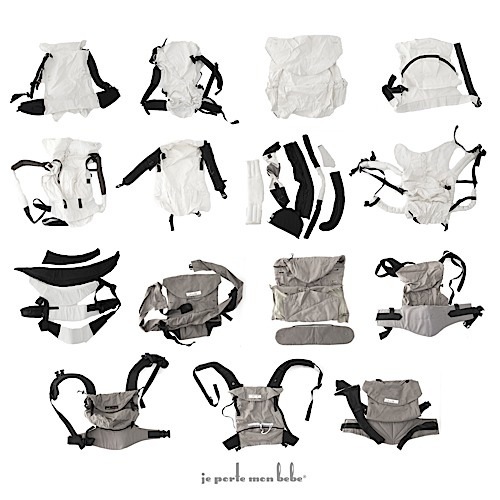 The Love Radius PhysioCarrier is a preformed baby carrier that comes with a removable booster (0-18 months) and a removable padded collar to support the neck (for infants). The collection will be available in several colors (for the fabric and the pocket). It can be carried in the front, to the side, on the back, from birth to 3 years. (3.5kg – 20kg, from 6 months for the back. The booster is useful from birth to around 18 months, depending on the size and weight of Baby. Unlike some models, the Love Radius booster goes only under the child’s bottom. Freshness and breathability are not reduced even with the booster in place, because there is no additional layer of padding on the back or the ribs. The booster slips into a sleeve to be an integral part of the baby carrier, making it even easier and faster to pop Baby in; it is also safer than first putting Baby into an insert and then into the baby-carrier. 1/3: To carry an infant in a high and secure carrying position (kissing height), leaving his/her respiratory passages clear and ventilated. In addition it enables Baby to be seated in a physiological flexion position without forcing the natural gap between his/her knees (a gap that must not exceed the width of the pelvis at this age). Removable booster with a 9 month old (left) and a 2-week-old baby (right). 2/3: The booster allows an older baby to enjoy greater visibility than ever before when he/she is carried on an adult’s back, as Baby is higher. 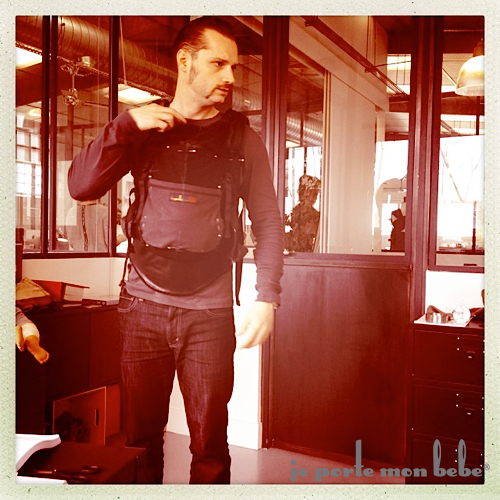 3/3: Finally, many baby-carrying adults will appreciate the backpack feel of this baby carrier, i.e. most of the weight on the shoulders and a higher center of gravity. Sasha (from the PESN manual cover) at 16 months, with booster (left) or without (right). The child on the booster is lifted higher so he can see, and can put his arms out. The removable pad slides into the collar, for carrying an infant. The side straps have different functions according to Baby’s age. Infant of six weeks and 30-month-old toddler. 1/2: For an infant, it allows adjusting the front panel’s height and width. 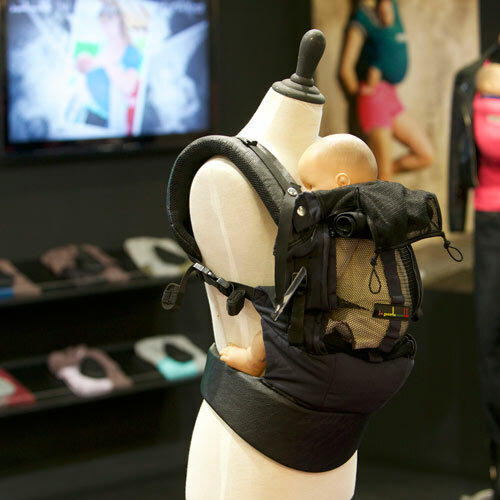 This various settings permits a precise adjustment of the baby carrier measurements, that offers you tailor-made solutions. The newborn will thus be well contained and the tightened straps allow the edges of the baby carrier to hold his/her small body snugly, providing support lines that allow the baby to be maintained in a curled up position and not flattened. These side straps also prevent the hypotonic infant’s back from going into an “S” position because the baby carrier is too large. 2/3: For a bigger baby (> 10 months), the side straps give support to the bended knees and help to better tilt the pelvis to provide Baby with a wide and comfortable seat. This also makes it possible for the arms to come out when Baby is awake. 3/3: The side straps will also allow weight distribution between the suspenders and the belt. This is possible because the anchor point of the straps goes from the suspender to the belt. This is useful if you prefer to put the weight on the suspenders and reduce the weight on the belt. 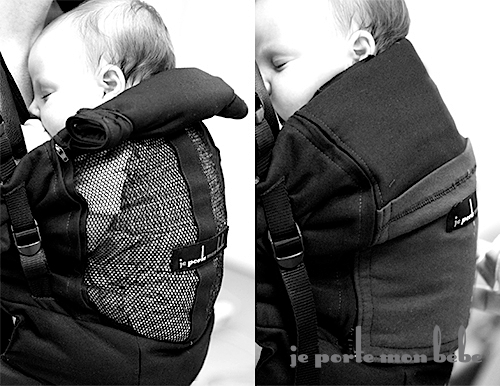 The side straps represent a unique and simple way to adjust the baby carrier, regardless of the child’s age. The baby carrier fits Baby, not the reverse, and without complicated and time-consuming procedures. Thanks to the opening in the baby carrier, Baby’s back can be ventilated and cooled when it’s hot, or covered when it’s cold, using the two zippers. The transparent mesh provides better visibility of Baby’s position and more precise installation. Adapt to the temperature and ensure Baby’s good posture in the baby carrier. The mesh head cover supports the head. And it is transparent, allowing the child and the person carrying him/her to see through it; it also keeps the respiratory passages unobstructed. Unobstructed vision and breathing through the head cover. The abundant padding on the suspenders and on the belt provides aerated, lightweight cushioning and unique comfort. 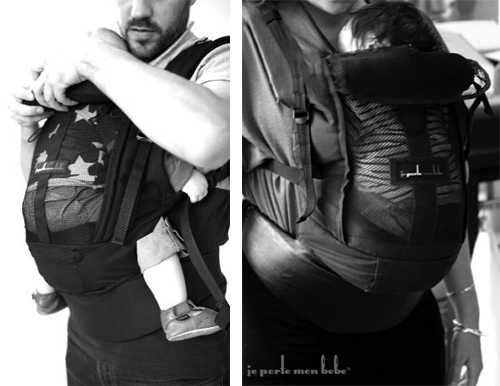 The suspenders of the Love Radius PhysioCarrier (above) compared to suspenders on a conventional baby carrier. No compromise for comfort and cushioning. The seat is shaped (not flat), putting the baby in a seated position with lower back curled and knees drawn up. This prevents the pelvis from being flattened. 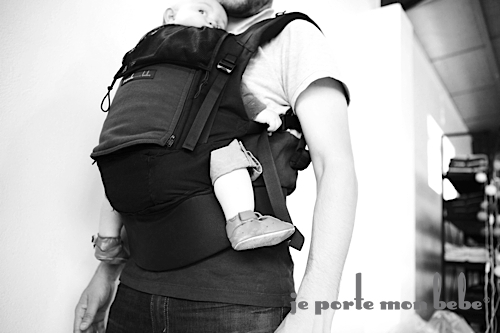 The double suspenders adjustment allows easy positioning, whether Baby is in a front or back carry. The suspenders can be crossed in the back when Baby is carried on the back. 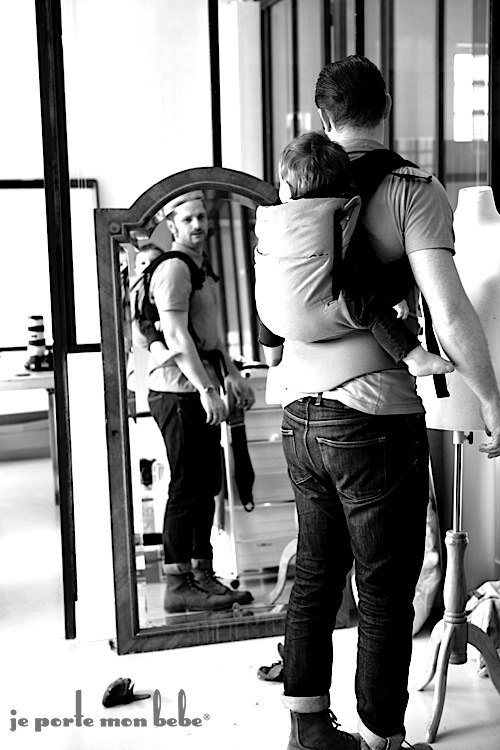 There is a (removable) mirror to watch the baby when he/she is being carried on your back. Back/chest strap with an elastic end-stop to facilitate the movement of the baby-carrying person’s shoulders while keeping the straps in place. 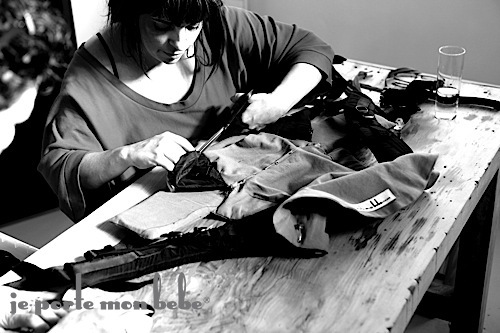 All straps have an elastic to keep them wound and not dangling. You can use it to carry a big girl who’s no longer a baby, but only as a stopgap. Thank you to our partners and our beloved Love Radius team, to friends of the brand and to the families for their support and their patience during these long months of multiple tests. 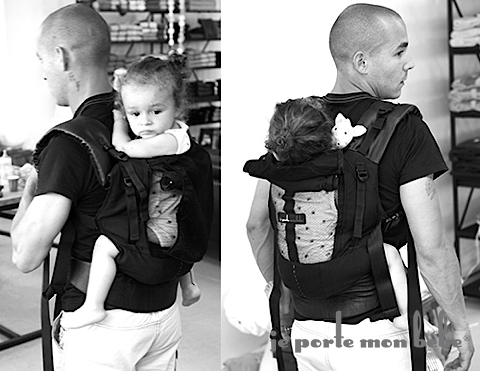 As in the development of the PESN, we didn’t rush the design of the baby carrier. Initial research began in July 2010, four years ago. The positive aspect is that we had plenty of time to think and experiment, to confirm or disprove various assumptions. We take this opportunity to share with you a few high points in the development of the PhysioCarrier. Several weeks of sitting sideways in a prototype. 2 ½ years old, nice nap in the warmth of a prototype without a belt. A very simple prototype to determine the anchor points of the side straps. “And if you pull on that, what happens?” From the very beginning, we tried to find ways to ventilate the back. This slightly weird prototype dates back to our old headquarters in the 19th arrondissement of Paris, for those of you who remember them. The first pattern and snugly-wrapped Stanislas, ages ago! Various tests at Love Radius using a rough version without the trimmings, to check the mechanical properties. Successful hugging session. On with the tests. It all started to take shape in 2012…. Stanislas leans back for fun and because he’s doing his own tests. He’s holding and playing with PESN rings in different sizes. This was in early 2013 before we launched the PESN and there were rings everywhere. Our gallery of first generation prototypes, experimental oddities and other really bad ideas we absolutely had to try! This was just a (long) preview, to be continued soon! Nice post showing the development of the product – love it! Didn’t realise that the people in your tutorial videos are actually employees (not just models), no wonder they look so at ease! Can’t wait for the cotton black physio carrier – love the insert, the mesh part and the neck support roll – going to buy one for sure! Any news when this one will be available? AHHH! Bravo. I am so excited to see this. I can’t wait. And I’ll be wanting one or two for the twins. I CAN’T wait!!!! PhysioCarrier is very nice, I am looking forward to touching it soon. Do you consider to ad hood for the case of rain to protect the head? Is material water/winterproof? Votre porte bébé a l’air génial! Plus simple à installer qu’une écharpe mais toujours respectueux de la physiologie de bébé, bravo! Bonjour, avez vous une date précise de la sortie? Merci! AHHHHHHHHHH, il a l’air trop top………… Vivement sa sortie pour pouvoir l’utiliser avec ma poulette fraichement sorti (Cette été…). et merci de toute ces infos…..
J’ai une question quelque peu déplacé mais je tente quand même. 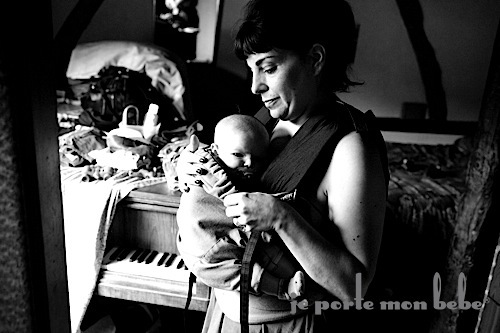 Vous avez mis une photo bébé porté de profil dans un prototype. 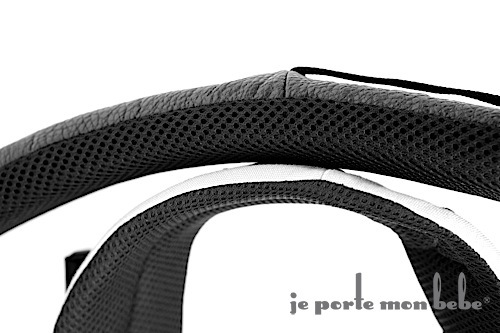 Vu que votre modèle est pas encore en vente, et surtout vu que j’ai déjà un ergobaby, sauriez-vous s’il est possible de porter de profil dans ce dernier ? Au fait il a l’air vraiment vraiment top le votre. 6 mois plus tôt, ça aurait été génial ! Vous pouvez essayer en assis de profil chez vous oui, avec un tout petit. Avec un bébé grand ses genoux vont être un peu serrés par contre.